With all the hype and press coverage around Triumph’s reinvented Bonneville family it’s easy to overlook the ‘lesser’ new Bonneville variants such as the T100 – but you really shouldn’t. 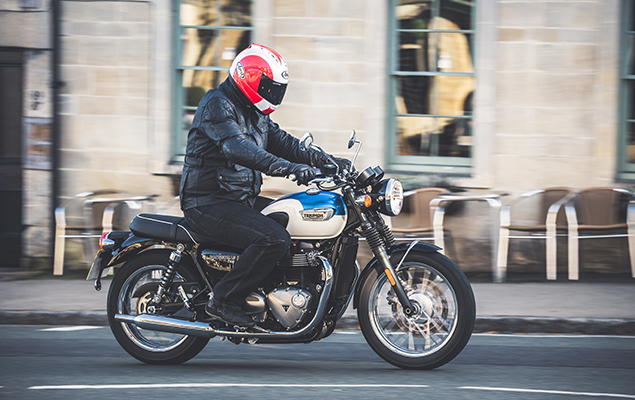 The Triumph T120 Bonneville is the headline roadster of the Hinckley firm’s retro Bonneville clan, boasting a full 1200cc from its parallel twin cylinder which in turn pushes out a healthy 79bhp. 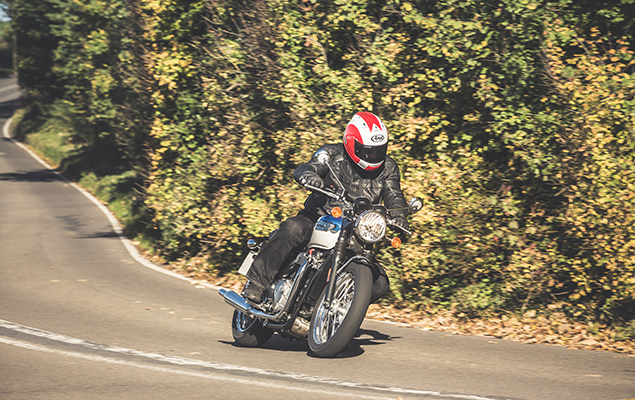 The T120 Bonneville also gets hauled up by twin front discs and delivers a brilliantly evocative all-round riding experience. In theory, the T100 could easily be dismissed for being its smaller less compelling little brother. In some ways that’s a fair guess. Instead of 1200cc, the T100 uses the smaller bore 900cc version of the Triumph twin with the result that peak power is curtailed to 54bhp. It also wears one disc less. Elsewhere the spec is reduced slightly with less chrome – but that’s it. Overall proportions and looks are unchanged. Most of the same options and accessories are equally available and the T100 evokes a spirit of the past just as effectively as the T120. Best of all, the smaller version is significantly cheaper than its bigger brother as well – £1300 less in fact when bought new. And that’s a serious consideration. From the saddle, however, you can hardly tell. One of the successes of Triumph’s reinvented Bonneville family is the new bike’s overall more substantial proportions – the old 865cc Bonneville was often criticized by taller riders for being too ‘dinky’. This is just as true of the T100. Don’t get me wrong – the T100 is certainly no monster. Far from it in fact. Instead it’s ‘just right’ – easy to swing a leg on board, light and sufficiently low to not be intimidating even for novices. An A2-compliant kit is available, and, with excellent, natural, upright ergonomics it certainly doesn’t come over as small or unsubstantial as was sometimes the case before. And from there on in the T100 simply gets better and better: a view forward over the sumptuously-styled retro tank (the cheapest version is plain black with two two-tone colour options, white/blue or white/orange, costing £300 more). The two new chrome-rimmed dials are just the right mix of classic and modern and include subtle LCD panels and LED warning lights for everything you’re likely to need. In short, as a lump of metal, Triumph have done a brilliant job of reinventing their classic Bonnie. Everywhere you look there are neat touches and well thought-out design, including the classic ‘peashooter’ twin exhausts and the stylish wire wheels. And all of that’s just about how the T100 looks. The Triumph roadster goes better still. From the outset its handling is completely neutral, easy and immensely confidence-inspiring. Triumph has a deserved reputation for getting the handling of its bikes right and this is certainly true of the T100. Steering is light, brakes tactile and the low down response from the parallel twin ample. Wind up the wick and, although never exactly exhilarating – with just 54bhp the T100 was never intended to be – it doesn’t feels exactly lacking, either. The junior Bonnie has been designed to deliver unintimidating, pleasing motion that reminds of a bygone era, which it certainly does and in spades yet with all the slick reassurance, crisp controls, proven reliability and 21st century build quality and features a modern machine delivers. Want to have your retro cake and eat it? 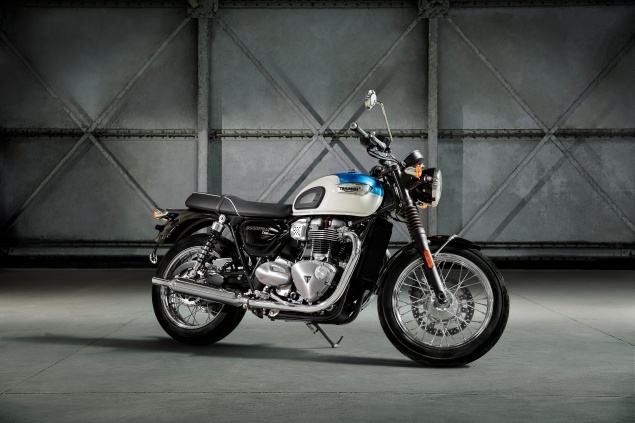 With Triumph’s latest Bonnevilles you can. Of course, all of that is just as true as many other members of the latest Bonneville family. The aforementioned 1200cc T120, the even more tuned Thruxton and US-style Bobber are just three that spring to mind as being excellent machines in their own right. But what’s virtually unique about the T100 is how successful it is at delivering all the style, quality features and adequate performance of a market-leading retro but at something that’s approaching a budget bike price. Yes, there are other Bonneville variants that are cheaper still – the Street Twin for example starting at under £8000. But for our money that bike’s lost too much chrome and forsaken too much by way of wire wheels or pin striping to retain its retro appeal. Not so the T100. Here’s a Bonnie with all the style and most of the sensation of the T120 but at a far more tempting price. Who needs a fast retro anyway? And didn’t we have to make our money go further in the old days anyway? PUB FACT: The T100 name along with that of the T120 aren’t just re-applications of names from the past. 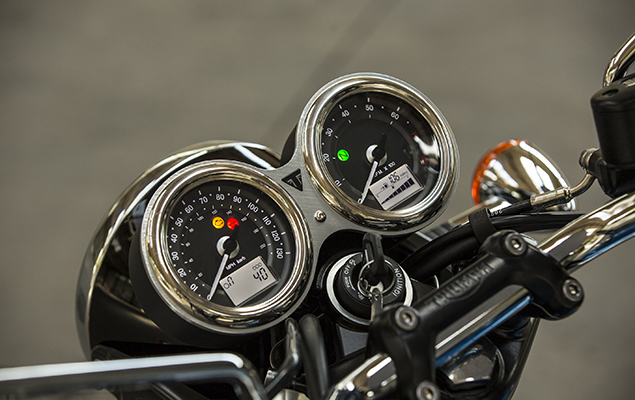 The numerical figure is intended as an indicator of each bike’s top speed as well. The difference here is that the ‘60s T100 and T120 were 500 and 650cc respectively. Today they’re 900 and 1200. So much for progress. Although the basic version of the T100 without the snazzy two-tone paint comes in plain black – it’s not the blackest version. There’s also version called the T100 Black which is the same price as the basic machine but also comes with black-finished engine, exhausts, wheels and more. Very stealthy.